The annual Desert Sport Festival takes place at Walvis Bay Private High School from 20 - 23 March 2019. Please support all our sport codes participating in the festival and show some true blue school spirit! 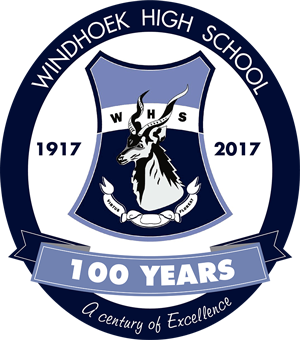 The 2019 LRC of Windhoek High School. Head Boy is Erik Strauss and Sonèt Crous is Head Girl. WHS is proud in offer the most comprehensive subject choice in Namibia. This gives our learners the necessary knowledge and skills to enter the job market, confident to take on the best and come out on top. Over and above the normal subjects, our curriculum also includes the following extra components: Entrepreneurial skills, Information Technology for learners in grade 8 -10, 24 hour access to Internet, AutuCAD for learners taking Technical Drawing, Turbo Cash for learners taking Accounting, Word Processing for learners taking Typing and a special Mathematics programme helping learners to practice the basic skills.